START is pleased to announce its continued help to fund the Sarasota Bay Watch’s expanding clam seeding program in Sarasota Bay. Clams are of great importance in our marine ecosystem because they are excellent filter feeders that improve water quality, they can live for over thirty years and they are very resistant to red tide. Sarasota Bay Watch’s latest endeavor is a landmark restoration with larger, more mature southern quahog clams that were raised by clam farmers down in Charlotte Harbor. There were four different seeding events of about 50,000 clams in each seeding that were held on consecutive Saturdays beginning March 2nd. The clams were transported in a refrigerated truck to keep them alive for the 2 hour journey to the new seeding ground near the Pier in Bradenton Beach. The four different installments were required because the refrigerated truck could only carry about 50 bushels of clams at a time. This seeding program is unique in both opening a new clam seeding ground in Manatee County, but also in the kind of calms that were used. These clams are much larger, more mature clams than the ones normally used for seeding projects. That’s because they could not be harvested during the recent red tide bloom and they grew too large for optimum restaurant market value. In the larger size, they were too big and tough to serve on the half shell and would be relegated to chowders and stews. The result for the clam farmer is a decline in market value of over 50%. However, clams of this size are ideal for restoration projects because their larger size and more robust shells makes them virtually immune to predators and their maturity makes them ideal breeders to start a new colony. As a result, the site by the Bradenton Beach Pier has a new clam colony and the clam farmers received some needed compensation for their efforts in raising the clams. It is a win-win collaboration. By the end of the four seedings, the new site will have 200,000 new resident clams that will filter 2 million gallons of seawater every day. This number will only increase with time as the clams grow larger, and as they reproduce and expand across the bay. START and Sarasota Bay Watch are working together as the “Johnny Appleseed” of Sarasota Bay – investing a little time and effort now to provide big rewards for years to come. Future generations will enjoy cleaner water and a healthier bay that is more resistant to red tide. 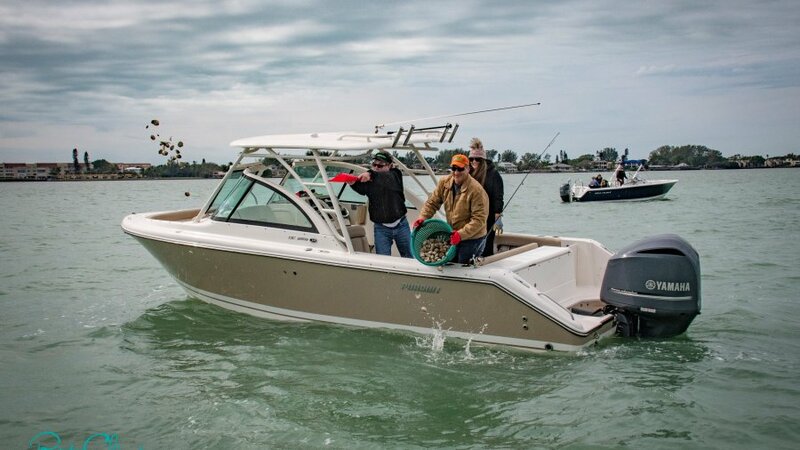 Sarasota Bay Watch President Steve Martin and Board Member Brian Jung seed clams into the Manatee County waters of Sarasota Bay during a recent release.